We used to live a few minutes away from the most amazing Middle Eastern fast food restaurant. The food was cheap, delicious, and plentiful, which worked well for us since we were on a tight budget. And whenever we went there, we’d always order what we called The Trifecta: Hummus, Baba Ghannouj, and Mama Ghannouj. With enough pita bread, you could make a meal out of those alone, and we often did. Because, you know, the whole tight budget thing. After we moved away, that restaurant was one of the things we missed most. And even now, 7 years later, we still talk about it once in a while. Because no one else sells mama ghannouj! I’m sure it exists outside of that restaurant, but I haven’t seen it. Which is a sad thing, because it’s delicious. Mama ghannouj is baba ghannouj made with zucchini. That was pretty much all I had to go on when working on this recipe. (Well, that, and a very hazy memory of what it tasted like.) So I used the same ingredients in baba ghannouj for this recipe, minus the eggplant. I tried oven-roasting the zucchini, but you really need to grill it–the smoky flavor of slightly charred squash is an important component of this dish. To cut back on calories, I used a little less olive oil than you’d typically use in baba ghannouj–I think the resulting dip is still creamy and smooth without it, but if you’re an olive oil fan, feel free to add as much as you like. We’re coming upon that time of year when everyone has an abundance of zucchini (well, everyone except me–thanks, vine borers! ), so this recipe is perfect for when you can’t even look at another loaf of zucchini bread. Throw some zucchini on the grill and make some mama ghannouj! Mama ghannouj is baba ghannouj made with zucchini instead of eggplant. It’s a great way to use up a surplus of summertime zucchini! Cut the top and the bottom off of each zucchini and allow them to cool. Once cooled, cut them into large chunks. Combine zucchini, tahini, lemon juice, garlic cloves, and olive oil in blender or food processor and blend until smooth. Transfer to a bowl and drizzle additional olive oil over the top, if desired. (I also like sprinkling mine with a little smoked paprika. It’s not traditional, but it’s delicious!) 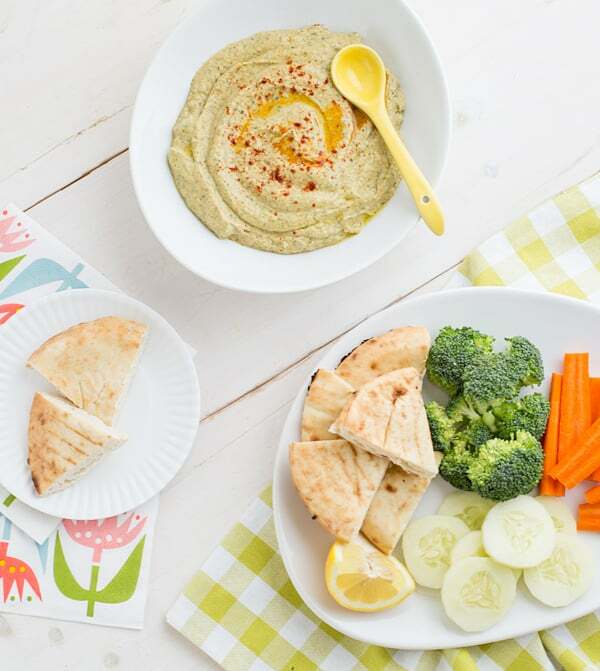 Serve with fresh veggies, pita bread or chips, or crackers. To grill the zucchini, lightly oil the outside and place them directly on the grates of your grill. The cook time depends on the type of grill you have and how hot it is, so it’s hard to be precise. Just keep an eye on the zucchini and turn them every so often. You don’t want them to burn, but they should have nice grill marks on them. I’ve never heard of mama ghannouj — love the name! It’s weird, I love eggplant but I find baba ghannouj bland. I want to try this version, and it looks gorgeous with the paprika on top. Must make. Well, after posting this, I started to think maybe it really was just something this restaurant made up? Because no one seems to have heard of it! Ahhh, send me some! My plant just died and I had to start another. And I’m sure that one will die after the vine borers get it. 🙁 But at least it’s cheap and plentiful at the farmers market! Oh, and yes, you can broil the zucchini! this looks yummy, but is there anything i can use as a substitution for tahini? Tahini has a very distinct flavor, so while there are things you can substitute for it, it’s not going to give you the same results. But I know some people use yogurt instead of tahini in baba ghannouj, so you could try that. Almond or cashew butter might work too. Love this! 🙂 I’m not a huge fan of eggplant for some reason. But I LOVE zucchini. Cannot wait to try this. Sounds delicious! we are starting to harvest zucchini for the first time this season. This recipe just moved to the top of my list! yum! Yay for zucchini! I can’t wait to see what you’ll make with it! Baba Ghannouj is the only recipe that will get my husband to get eggplant and we love the smokey flavor of it. I think I’m going to use this as a hummus since we don’t eat beans. Delicious! I’ve never heard of mama ghannouj, but it sounds like a good idea for people who hate eggplant (not that baba ghanouj has a very strong eggplant flavour anyway). 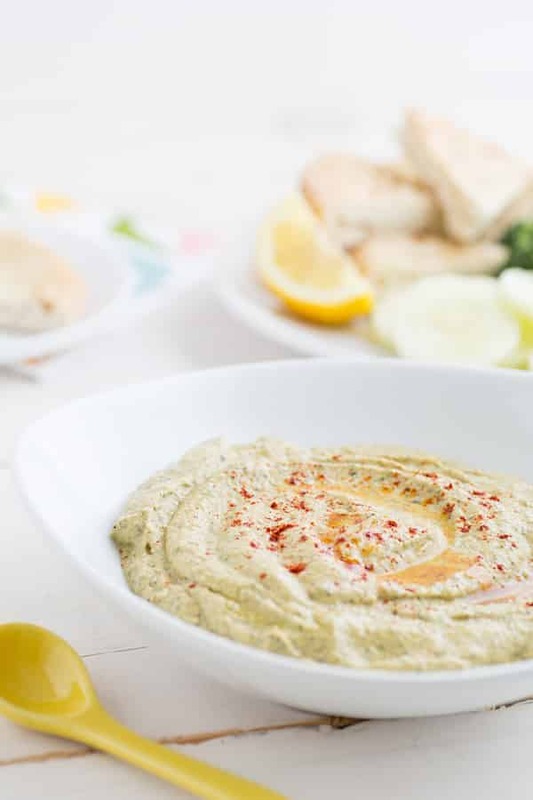 I can’t believe how creamy that dip is, even though its just made of grilled zucchini, tahini, lemon juice and olive oil! Oooh – this looks really nice. I am a huge fan of chickpeas and houmous but trying to cut down on the calorie intake — this might be a reasonable compromise. I over-ordered courgette this week so I might even do it at the weekend. Can’t wait to try! I’m planning to make it over the weekend. My son won’t eat chunks of courgette but will eat courgette soup. He’s a big fan of ‘dippy-dip’ as he calls it, so I think this could be a winner. This looks good and I love eggplant and zucchini, so I would be good with either. We love Middle Eastern food. There’s a place close to us now that’s our go-to, but they don’t serve this. I’m going to have to try making this one. Thanks! Oh good, someone else has heard of it! My best friend’s mum, who is Syrian, has been making this ‘mama gannoush’ for ages. It’s better than baba ganoush in my eyes. We enjoy it during Ramadhan and in light summery days when zucchini is plentiful and fresh! Is the zucchini peeled at any time? I tried making this however it turned out kind of runny. Any suggestions to thicken it up and make it more creamy, as shown?! I’m sorry to hear that! It could be that your zucchini released more liquid into the mama ghannouj than mine did. If you cut into the zucchini and it seems wet/mushy, you can let it sit in a colander for a few minutes to drain off some of that liquid. I haven’t had that happen with mama ghannouj before, but I’ve done that with eggplant when making baba ghannouj and it works pretty well. I made this the other day and it was phenomenal. I didn’t have any problem with it being runny. When I peeled and chopped the zucchini some juices escaped, which I discarded. Try splitting the zucchini in two before grilling. This will draw out the excess moisture and add more grill marks to the actual flesh of the Zucchini not just the skin. Depending on the size of the zucchini you may talso scrape out the seeds with a spoon. That pulp and seeds contributes water as well. I make this with an equal amount of eggplant and zucchini. Adding in some crimini or shiitake mushrooms really boosts the flavor (umami). For heat, harissa added in or served on the side is wonderful. I’ve actually taken this and tossed it with greens, pasta, or poatatos after adding olive oil for nice summertime salads. Great for outdoor get-to-gethers and picnics! Thanks for this!